I have a new favorite cake. It comes from an unlikely source, for me – Donna Hay. If you’ve been following my blog or Twitter stream for long, you may remember that I have hit and miss issues with recipes from Donna Hay. The majority of her recipes I have made have ended up either in failure, or I just simply didn’t like the end result. I’m not a novice at baking (although I’m far from being an expert) so I couldn’t understand why I’d have so much trouble with Donna Hay’s recipes. I wasn’t even overly happy with her box mixes! I eventually came upon my own conclusion that Donna Hay is a food stylist, not a chef. Her food, magazines and products are absolutely stunning, but when it comes to recipes, they’re just not that great. In my own opinion. I still buy her magazines though. I loved Autumn’s issue. There were so many yummy-looking recipes to help a cold person warm up over winter. One really stood out for me, which was a ginger, cardamom and pomegranate syrup cake. I wanted to make it, but I wouldn’t know where on Earth I could find pomegranate molasses, and I had never opened a pomegranate before (that task always seemed a bit daunting to me). So I set the magazine aside for another day, for if I ever came across pomegranate molasses. The other week, I decided to visit Thomas Dux for some reason (can’t remember what I originally went there for) and discovered a tiny unassuming bottle in the baking section. It was filled with some sort of dark liquid. 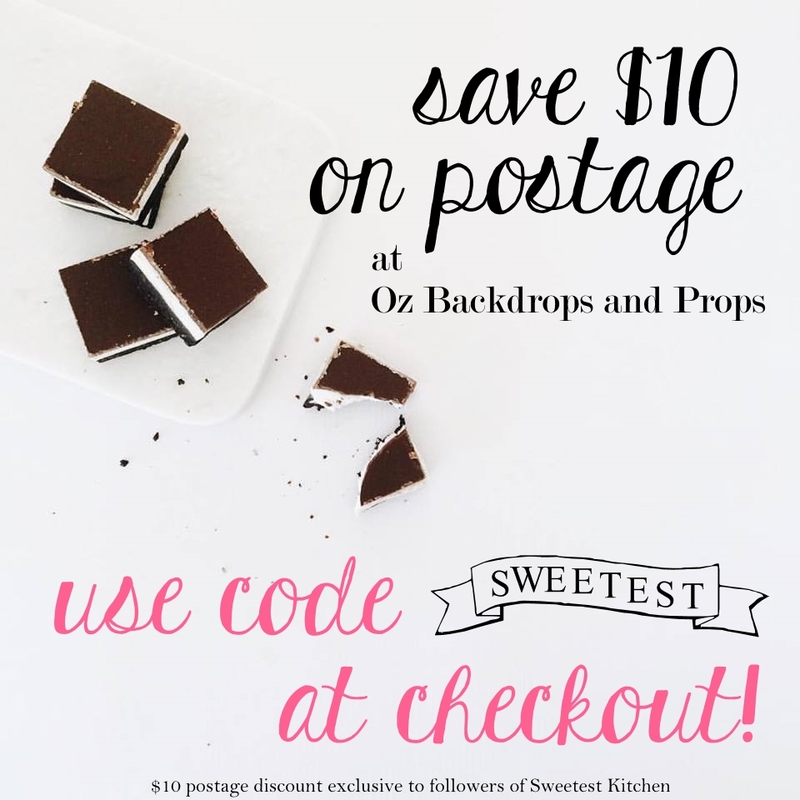 I bent down for a closer look and read the little words – pomegranate molasses. Finally! I hadn’t even thought about looking for it in quite some time, but upon discovering it, I bought it immediately and then forgot why I originally went to the shop in the first place. Here is the pomegranate molasses. If you can’t find it at any shops, visit Herbie’s Spices online and buy a bottle to have delivered to your door. The making of the actual cake itself is laughably easy. Simply place everything in a bowl, stir, pour into your baking pan and then put it in the oven. That’s it. But getting the seeds out of the pomegranate? Not so easy. This is where my confusion about this recipe starts. 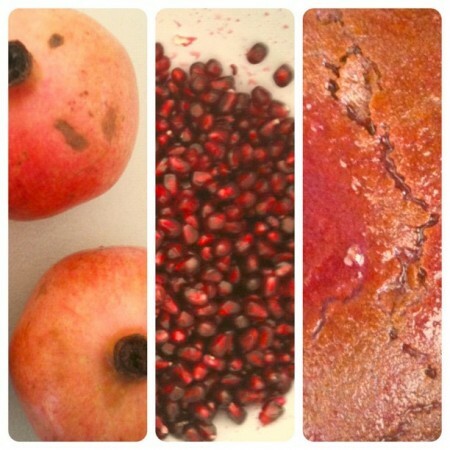 In the ingredients list, it states “3 pomegranates, seeds and juice removed and reserved”. I thought to myself, there isn’t any juice inside of a pomegranate, is there? No, there isn’t. Unless you pop some of the seeds. Well, I spent the entire hour while the cake was baking removing seeds from the pomegranate. I followed some instructions online (using method #2 on that post), just basically making some slits in the pomegranate, pulling the fruit apart and loosening the seeds. Yes, it messy, but oddly enough, despite all the warning about the juice sprays staining, and despite the juice spraying everywhere during my attempt at deseeding this thing, absolutely nothing got stained – not even the shirt I was wearing! Okay. So how was I going to get pomegranate juice for the syrup, especially if I needed the seeds to adorn the top of the finished cake? Well, I glanced into the bowl in front of me, which held the seeds from 3 pomegranates, and I decided that I had more than enough seeds to decorate the top of the cake. I scooped out a rounded handful of the seeds (as the recipe doesn’t state how much juice you actually need) and put them in the blender to juice them. I strained this in a sieve, and added that juice to the sugar to make the syrup, which you see in the last frame of the photo just above this paragraph (it’s a photo of the juice on the cake). The cake smelled delicious while baking in the oven. It was such a warming smell. When it was done, I poured the sticky pomegranate syrup on top of the hot cake and let it cool. I also poured a couple of spoonfuls of the syrup in with the seeds and gave it a gentle stir to give them more of a glossy sheen. When the cake was cool to the touch, but still just ever-so-slightly warm, I placed the pomegranate seeds on top. That was a frustrating task, actually, as the seeds kept rolling off the edge of the cake! Not to worry though, the stickiness of the syrup eventually held them in place. How beautiful does it look! I was quite pleased with the appearance of my cake, but I knew the real deciding factor was going to be when I finally stopped taking photos of it and tasted it. Would this cake restore my faith in Donna Hay’s ability to write a recipe that ended up as tasty as it looks in her photos? It was actually so delicious that I couldn’t find words to describe it. Even now, I have a little trouble. The cake is heavy and dense, but only just. It actually is a perfect texture for the kind of cake that it is. The pomegranate seeds lent an interesting flavor and texture to the overall taste. Mind you, this was the first time I had ever tasted fresh pomegranate seeds. Little bursts of juice from the seeds lit up each bite. But what I enjoyed about this cake the most was it’s depth of flavor. It is full of the kind of thing that you seek comfort in on cold nights. Wow, I really am lost for words, I cannot describe it! 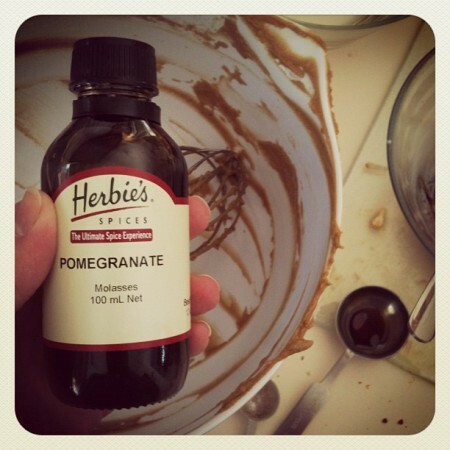 Now some other notes about the cake… I have read online that if you can’t find pomegranate molasses, just leave it out. Substitute more treacle, perhaps. If you can’t find treacle, maybe golden syrup or dark agave nectar might work. I didn’t have a 24cm round cake pan, so I went out buy one and could only find a 23cm springform pan. I bought it to use, and it worked just fine. I had tons of leftover pomegranate seeds. Perfect for juicing! How does the cake taste on the next day? You’d expect the flavor to enhance, right? I don’t think it did. I kept it in the refrigerator because of the seeds, although it probably would have been alright at room temperature since it’s been so cold here. The next day, the cold cake felt like a brick – it was super heavy and dense. A quick blast in the microwave took care of that, and while it still tasted nice, it didn’t have that depth that it had fresh from the oven. Therefore, I am going to recommend that if you make this cake, plan to serve it all in one day and as fresh from the oven as possible (while it’s still soft and slightly warm). I still have one lingering question about this recipe, however, which is, how much juice is needed to make the syrup? If I ever find out, I’ll let you know. UPDATE! I inquired about this on Donna Hay’s Facebook page and her team responded within 2 minutes. They said that each pomegranate will yield about 1/4 cup, or 60ml, of juice. For the syrup, you should use about 3/4 cup of juice to make the syrup. I then had to ask about whether we should be placing the seeds in the blender to juice them, as there wasn’t any juice in the pomegranates, except within the seeds. Their reply was that there should have been enough juice in the bowl collected from deseeding the pomegranate. But if there wasn’t enough juice, placing the seeds in the blender is fine. However, I did see somewhere online that someone actually a purchased a bottle of pure pomegranate juice to use in the syrup. 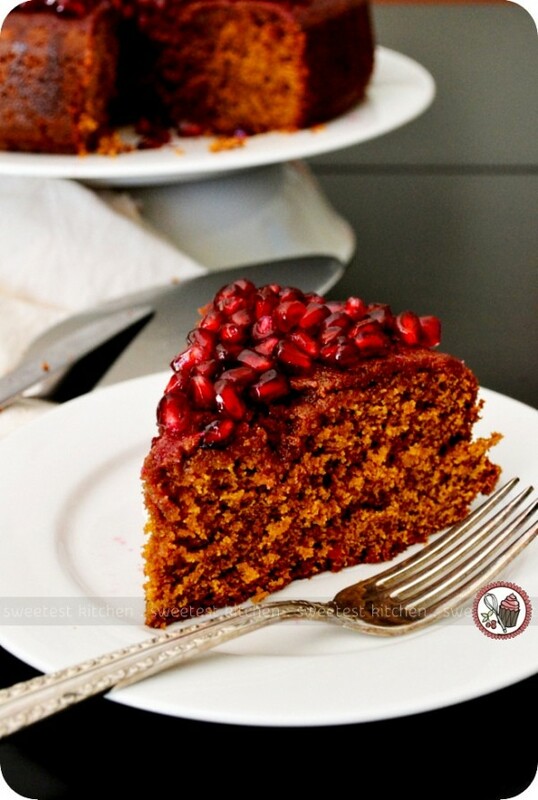 Doing it this way, you could just buy one pomegranate and one bottle of juice – use the seeds from the fresh pomegranate to adorn the cake, and 3/4 cup of juice from the bottle for the syrup. 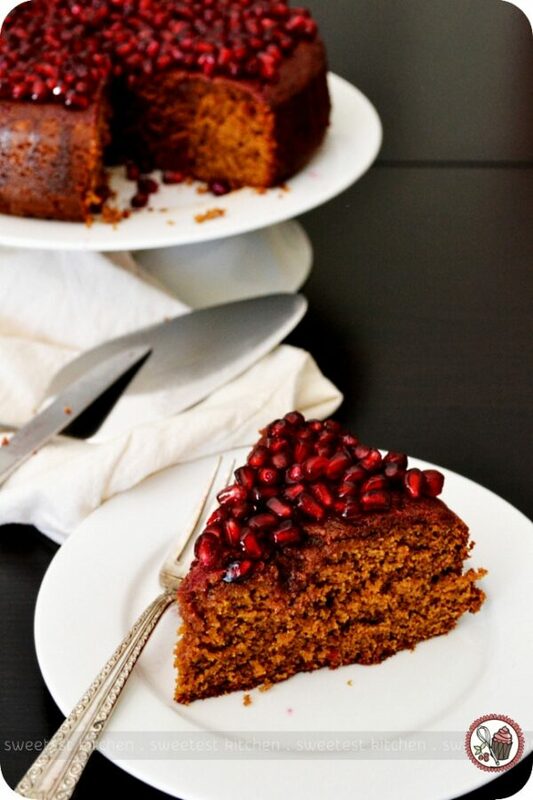 Perfect for the cooler autumn months, this decadent cake from Donna Hay, featuring the flavors of ginger, cardamom and pomegranate, is sure to be your new favorite. Preheat oven to 160C. Lightly grease and line a 24cm round cake tin. Place the buttermilk, eggs, sugar, molasses, treacle and butter in a bowl and whisk to combine. Add the ginger, cardamom, flour and bicarbonate of soda and whisk to combine. Pour into prepared tin. Bake for 1 hour, or until cooked when tested with a skewer. Place the pomegranate juice and sugar in a bowl and mix to combine. Pour over the cake and allow to cool completely in the tin. 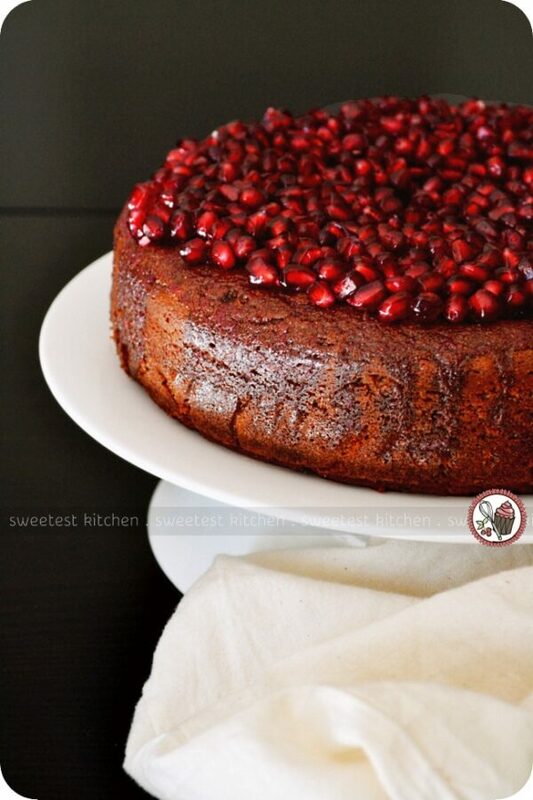 Remove cake from the tin and sprinkle with the pomegranate seeds to serve. *You should have about ¾ cup of pomegranate juice. If you don't have enough juice, place some of the seeds in a blender and then strain out the juice. Alternatively, buy a bottle of pure pomegranate juice to use; this would mean you'd only need to purchase 1 fresh pomegranate (to get the seeds from to adorn the cake). this is one of the most unique, beautiful cakes I’ve ever seen! This recipe looks amazing! Do you know if pomegranate molasses and sour pomegranate molasses are the same? Syrup cakes always end up tasting lovely, not matter what fruits you end up using in the end. Pomegranate is nice though. Creates a really sweet flavour that is not to sugary. Lovely, lovely cake, Jamieanne. I love both cardamom (so fragrant) and pomegranate. I can imagine the deep, rich taste this cake has. `It is perfect for the Christmas table. if you roll the pommegranate on the bench before cutting it open the seeds will fall out easily and it will also release some of the juice so you shouldn’t need to blend anything! Thanks so much for your thorough going over of this recipe! I eat pomegranates a lot, and was also totally confused by the 3 pomegranate bit. I can’t imagine how they would butcher the poor thing to get 3/4 cup of juice out of it just by removing the seeds. Way to track down the info! I think you could also use non 100% pomegranate juice as long as you reduced the sugar, and maybe in some cases did a reduction with the juice. Disagree with the pomegranate molasses substitution – better to make your own (using juice, sugar, and a reduction), or maybe put in a TBSP of another tart fruit syrup – like raspberry rather than substitute treacle. Also really appreciate your comments on how it tasted the day after – As I was planning on making it the night ahead. I was looking for a molasses substitution, thanks for this.